Wwith 50 domestic trophies to their name, it's no surprise that Red Star Belgrade (in English), Crvena Zvezda (in Serbian) have been the most popular Serbian club for as long as anyone can remember. In addition to that, they are famous for being the only ex-Yugoslav club to have won the European Cup. Their home stadium, commonly referred to as the "Marakana" from the days it used to hosted more than 100,000(!) fans, has a notorious reputation of being one of the most intimidating places to play at. They have a long-standing city rivalry with Partizan, and their derby matches are a historically venerable source of drama and spectacle. 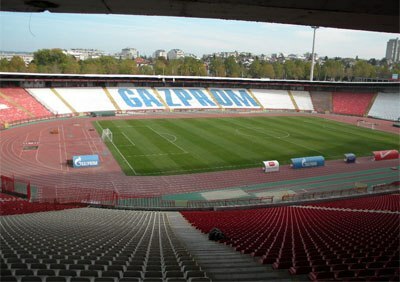 Red Star's Rajko Mitić Stadium. The club was formed in 1945, a couple of months after the end of the World War II. Right from the start, they were adopted as a symbol of Yugoslavia, thus gaining millions of fans in a very short time. After breaking their duck by claiming three consecutive national cups between 1948 and 1950, Red Star followed it up by clinching their first championship with a dramatic last-day derby victory over Partizan. Red Star's first golden era came with the arrival of a talented generation led by a strike partnership of Rajko Mitić and Bora Kostić. Between 1953 and 1960, these talented youngsters led the club to five championships and two national cups. These early domestic successes were accompanied by strong showings on the international scene, as the club made the European Cup semi-final in 1957 and the quarter-final in 1958, losing to Fiorentina and Manchester United, respectively. The second leg of the latter match is especially memorable for being the final game the famous "Busby Babes" would ever play, as their plane crashed on the return flight the following day. After playing second fiddle to Partizan for most of the 60s – but still managing to win a Double in 1964 – it was high time for changes to be introduced. In 1966, the club officials hit the jackpot by appointing Miljan Miljanić as the head coach. Soon enough, Red Star established themselves as the top-scoring club in the country. This era is mostly remembered for Dragan Džajić, a voracious left-winger who is still considered to be the greatest Serbian player of all time. Between 1966 and 1975, Miljanić and Džajić led Red Star to four championships and three national cups. Their larger-than-life presence was felt even after their departures, as the club continued to be a dominant force, claiming six additional domestic trophies in the following decade. In 1986, the club's officials began to build a team that could contend on the international scene. With a well-rounded team led by Siniša Mihajlović, Robert Prosinečki and Dejan "Il Genio" Savićević, Red Star finally managed to make the European Cup final in 1991, where they defeated Olympique Marseille on a penalty shootout to grab their first and only major European trophy. The domestic competitions were seemingly an afterthought during this period, but the club still managed to claim four championships and one national cup. The breakup of Yugoslavia in 1992, as well as the departures of the entire golden generation, brought an end to Red Star's relevance as a giant of European football. While they remained massively successful on the domestic front, winning seven championships and twelve national cups in the years that followed, the civil war and US sanctions proved to be tough obstacles to overcome. One thing that has obviously always been in Red Star's logo is a “crvena zvezda”, Serbian for “red star”. Today's crest has been in use since 2011, and is almost identical to the one they used from 1950 to 1995. The only real difference is the addition of the two stars on top, corresponding to the 20+ national championship titles the club have won. As for “ФK”, it stands for “Фудбалски Kлуб”, Serbian for “Football Club”, in Cyrillic, the prevalent alphabet in Serbia.